Although it is somewhat expensive, atmosphere of Japan could be enjoyed fully! Guest rooms are tatami floored rooms (Japanese-style, with futons instead of beds) . Public baths are available all-night. We also have a beautiful Japanese garden. Attention: Bed Rooms, in the above description about Room Type, are Not Western-style Beds, But Futons (Japanese-style Clothes used on Tatami Floor). 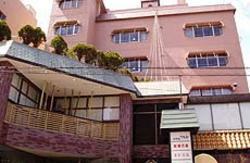 We have 9 Japanese-style guest rooms. The environment around our ryokan is very quiet and peaceful, so you can relax and easily remove your tiredness of your travel. Please enjoy our traditional Japanese structure. From Private Rooms, you can appreciate a beautiful Japanese Garden. 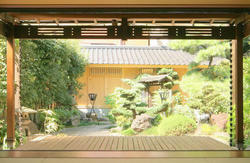 Our Japanese-style public baths (divided between a Men's bath and a Women's bath), beside the Garden, are open 24 hours. Please note that our last check in is at 21:00. - They and Descendants of Ieyasu laid the groundwork for Nagoya (16th Cent. ---> 19th Cent.). 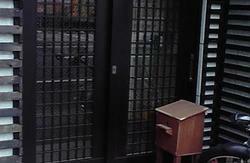 - Established in Nagoya: Toyota, Noritake (Pottery), Masamura (Devised Modern Pachinko System), etc. There is Unique Atmosphere in Nagoya! December: Handbell Concerts (e.g. Nagoya Sta. Zone, Kanayama Zone), Illuminations around Nagoya Sta.